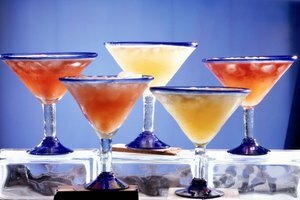 Originally from Mexico, the margarita might just be America’s most popular cocktail, with more than 185,000 drunk every hour across the nation. Although it is the signature drink of Cinco de Mayo celebrations, the cocktail can be enjoyed all year round. Whether you're drinking margaritas by the glass or sharing a pitcher, the experience should be fun and unpretentious. This is a cocktail, after all, that needs just three ingredients and stays away from fancy flourishes. The typical blend is 2 fluid ounces of tequila, 1 ounce triple sec or Cointreau, and 1 ounce fresh lime juice. Nothing quite hits the spot, though, like 100 percent agave tequila, preferably reposado, which is aged in oak casks. Anything labeled otherwise could contain cheap, less illustrious sugar cane spirits. Although some bars use ready-made sweet and sour mix, the best way to drink a margarita at home is with fresh lime juice. Part of the margarita’s appeal is the fine balance between sour, citrus aromas and the tequila. Prepared mixers can’t achieve the same subtlety and can taste harsher. Both triple sec and Cointreau bring a bitter orange finish, but the latter has a higher alcohol content, thus a more fearsome bite. For those who are introduced to the margarita as a frozen drink on vacation, greater possibilities beckon. While frozen margaritas have their place, this is not a cocktail that is meant to be blended in bulk and dispensed from a machine. In fact, the only purpose of freezing is to trick the taste buds to conceal low-quality ingredients. If you do want to drink it frozen, prepare a standard cocktail and blend it with ice in a food processor. 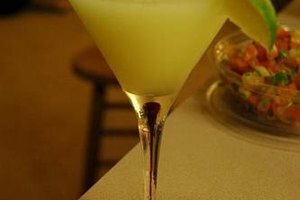 If you are serving a frozen margarita, a cocktail glass is not appropriate. Instead, go for a highball glass or tumbler. 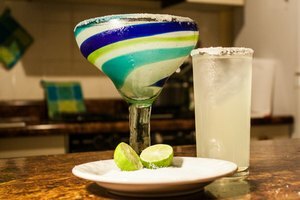 The margarita is meant, though, to be drunk "up," meaning it is shaken over crushed ice in a cocktail shaker and poured through a strainer into a cocktail glass, held by the stem to keep the hands from warming the liquor. 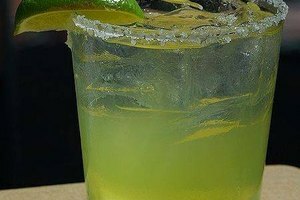 Arguably the margarita’s most distinctive feature is the crusty salt rim on the glass. To drink it this way, run a slice of lime over the rim and dip the glass in a good quality, coarse salt. For a little extra spice, dust the rim with chili powder, too. Drink the margarita either through a straw, which rather negates the purpose of the crust, or work around the rim, drawing the tequila over the salt with each sip. Other than the salt, the conventional garnish for a margarita is a simple slice of lime, but this is hardly a cocktail given to convention. More adventurous approaches include garnishing the mix with frozen berries, cilantro sprigs or spicy habanero chilis. To drink a margarita that will leave a pleasant tingling on your lips, steep jalapeno pepper slices in the mix and refrigerate for an hour or so until the aromas are fully infused. The tequila and triple sec/Cointreau are non-negotiable, but margaritas don't have to be drunk exclusively with lime juice. Many juice mixers are just as refreshing. For a lighter or fruitier mix, omit the lime juice and substitute anything from pomegranate, blood orange and grapefruit to watermelon or pineapple juice. You can even add a dash of light beer to the mix for a fizzy finish with a hint of hops. 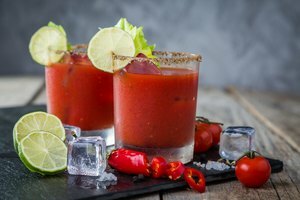 If you are drinking margaritas with dinner, bear in mind that spicy foods can make the lime or citrus juices taste bitter, so match dishes heavy in jalapeno or serrano peppers with a spicy margarita. The citrus, on the other hand, pairs well with those classic Mexican dishes marinated in lime juice, such as shrimp or ceviche, while tortillas or tacos seasoned with fresh cilantro are best set off by a margarita garnished with a few sprigs of the same.